American Cable & Rigging StoreBlogUncategorizedWhy Should You Choose a Cable Railing for Your Home? 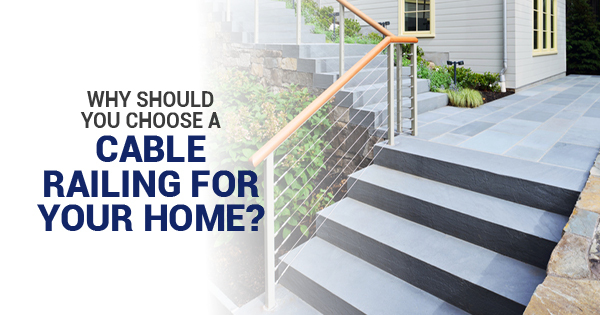 Why Should You Choose a Cable Railing for Your Home? There are a lot of different elements to a home that aren’t usually thought about right away. One of these elements is railing. While railing may seem like a trivial thing, it plays an important role in homes. And when it comes to choosing railing, homeowners have a lot of different options to choose from. So let’s take a look at a few reasons why homeowners should consider cable railing. Safety: Railings are generally installed for one purpose: to prevent people from falling. Installing railings next to staircases is often one of the first things homeowners do, especially with staircase accidents being the second leading cause of accidental injury, behind the number one cause, which is car accidents. So if homeowners have a stairway, landing, or deck in their home that doesn’t have a railing, cable railing hardware is a good option. Cable railings are sturdy and can help prevent people from falling and getting injured. Easy Maintenance: Cable hardware is made from durable stainless steel, which makes cable railings extremely strong. But not only is cable railing hardware strong, but it’s easy to take care of too. When homeowners choose cable railing, they won’t have to worry about their outdoor railings wearing away from the weather or other environmental aspects. And because cable railings tend to be pretty minimal, cleaning is a breeze. If homeowners are looking for durable, low-maintenance railings, cable options are the way to go. The view: One of the great things about cable rail fittings is that with cable railing, the view on the other side of the railing isn’t obstructed. This is a huge benefit especially for homeowners looking for deck railings. With the right cable railing supplies, homeowners can have a safe and effective railing around their deck and still be able to see the amazing view the surrounding area offers. And inside homes, cable railing hardware can keep an open layout of the home and allow an unblocked view from stairways and landings. All in all, the right cable and rigging supplies can offer the safety aspects of railing without sacrificing visibility. As you can see, there are numerous benefits of choosing cable railing for your home. So if you’re in the need for railing, consider cable railing to increase safety, durability, and unobstructed views both in and outside of your home. We ship cable railing parts all over the USA and stand ready to help with your cable-rail cable and hardware needs, just give us a call or email us! Scott Baker on Why Should You Choose a Cable Railing for Your Home?